And so whaddya think happens? We find a Wee Thomas, of course. Basement cat has a fierce! Someone had to have another kitty. 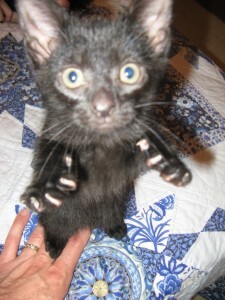 And there this one was, all black and friendly-like. And so, in honor of Martin McDonagh, it’s Wee Thomas. He’s quarantined for a week or two, since he just came from the shelter. This is very troublesome to Raoul, who is sure there’s another cat behind that door. More photos below. There’s a maxim in comedy, which I’m sure has a proper name, but I just call it the 9-rakes rule, based on the Cape Feare episode of The Simpsons. Stepping on a rake once is funny, the second time is less funny, the third time starts gettting repetetive and boring, but sometime between the 4th and the 9th time it gets funny again. The same principle applies with violence; too much is often better than the right amount. Quentin Tarantino understands this, as does Robert Rodriguez. And so, it turns out, does Martin McDonagh. We saw his dark comedy, his “comedy of terrors” if you will, The Lieutenant of Inishmore, last night at Signature, and it goes so far overboard on the violence that it made me wonder if I was a bad person for giggling uncontrollably at some of the scenes. McDonagh also wrote The Cripple of Inishmaan, which we saw at Silver Spring Stage in March. Cripple was very dark, and we had heard it was one of his cheerier plays, so weren’t sure what to expect from Lieutenant. Especially considering it was billed as comedy. But it was in the smaller ARK space at Signature, so at least it wasn’t going to involve the Broadwaysturbation that’s becoming more common in the MAX space (notwithstanding the fact that this play was nominated for five Tonys in 2006). We weren’t disappointed. More, with some spoilers, below the fold. Young man, there’s no need to ask why. I said, young man, don’t you let yourself cry. I said, young man, where your stature will grow. It’s fun to star on the A-C-S–R. Check this out! The ACS Repair hardware is loaded into the LOPE (Large ORU (Orbital Replacement Unit) Protective Enclosure) and ready for launch. Hubble’s best camera will be working again soon! You got your Low-Voltage Power Supply Replacement (LVPS-R) up at the top, and your CCD Electronics Box Replacement (CEB-R) at the bottom of the picture. The aluminum-colored plates on the top of each box swing up and out of the way by turning the T-handles, then the boxes slide out. Well actually for the CEB-R you also have to flip the green handles and move them out of the way first as well. 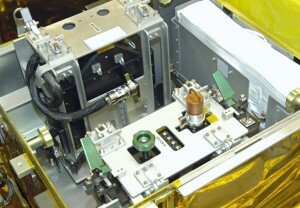 Once installed on Hubble, the harness you see sticking out of the LVPS-R gets connected to the CEB-R, where you see the red shorting plug on there now. There’s more info on ACS Repair at their website. So now it’s up to the installation crew to get the carrier loaded into the payload bay, and then our astronauts to install it. And we have to not get eaten by alligators, which doesn’t seem too difficult. 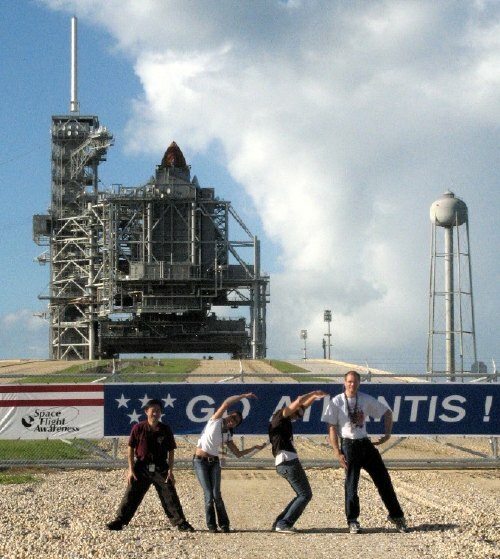 Here are some more shots from yesterday’s tour of Endeavour. This post really should be put into my standard slideshow format, but when my hard drive died it took my /bin folder with it. I had /Applications and the important parts of /Documents backed up, but /bin is the poor cousin in the Mac hierarchy. So I don’t currently have the script to build a slideshow page. I’m sure it’s on some hard disk somewhere, but I don’t have it now. So you get ’em like this. Let’s start outside the Vehicle Assembly Building. Look, it’s Cepi’s Angels! 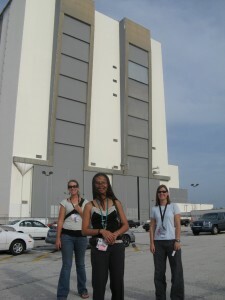 Erin, Kathleen, and Becky in front of the VAB. We didn't go in there. But nothing was happening in there, so we didn’t go in. 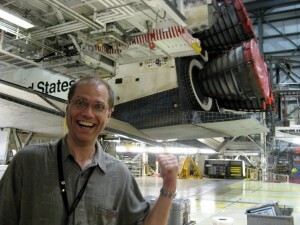 Later this week they’ll be stacking Endeavour in there (attaching it to the external tank, and boosters). With any luck I’ll get to see that too. You are currently browsing the I Think I Need a Shoehorn weblog archives for the month September, 2008.